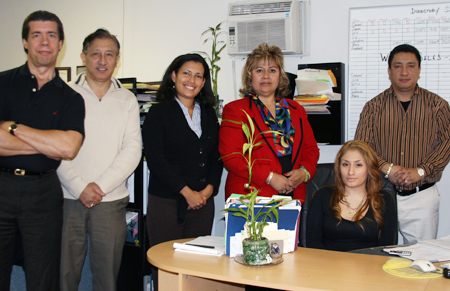 Latin Media NW staff, from left: Sig Unander, public relations; Efraín Lu, publisher; Gisela Foster, assistant editor; Carmen Lu, publisher; Lila Alvarez, marketing manager (seated); and Sandro Lu, general manager. ¡Noticias Latinas! publisher Carmen Lu was working as a volunteer at Programa Hispano when she came up with the idea to establish Noticias Latinas (Latin News). Along with husband Efrain, Carmen worked on a monthly newspaper designed to meet the information needs of new immigrants. By connecting their readers with local resources for employment, education, health and human services, city and county government, the newspaper became a one-stop source for news and information. Responding to demands from the growing local Latino community, ¡Noticias Latinas! is now published every week. Distributed at Latino-owned businesses in the Portland/Vancouver metro area, the paper is also available in Medford, Madras, and Eugene. 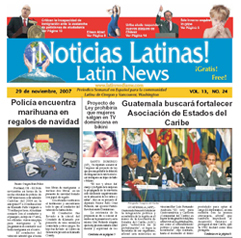 Noticias Latinas boasts a 25,000 circulation, and reaches about 200,000. “The multiplier factor for Noticias Latinas is greater when compared Anglo publications. Typically, Latinos have several generations or more than one family living in the same house. The paper gets passed around a lot more,” says Sig Unander, public relations director. “Our mission is to inform the community and provide local news. People who are coming in to the area and maybe new to the country need help with ( U.S.) culture, how things work,” says Carmen. Moving to a weekly production schedule is a big and important step for Latin Media NW, which also publishes Paginas Amarillas, the Hispanic phone directory. For the Lus, growing the business is the result of many years of hard work and establishing trusting and respectful relationships with their advertisers and readers. The success of the publishers of Noticias Latinas is a classic story of how hard work, persistence and determination pay off for immigrant families. As natives of Peru, Carmen and Efrain decided to move to the United States during a time when the Peruvian economy was steadily declining. “My husband worked for the Peruvian government, so it wasn’t that bad for us. It was getting really bad for the rest of the country. We decided it was time to go and make a new life,” Carmen says. After spending a few years in California, the Lus moved to Oregon. Here, they found a small but growing and diverse Latino population. Noticias Latinas started out as a home-based business for the Lus. Both Carmen and Efrain continued working full-time, while courting advertisers and becoming more known in the community. “It’s hard for small businesses to get started. My husband worked at his job for five years. We only had one employee when we started the paper. A lot of people helped us on a volunteer basis,” says Carmen. Since ¡Noticias Latinas! was first published, Carmen has observed many changes in the community. In recent years, Carmen has seen more people moving to Oregon from Central and South America. She stresses that while immigrants from Central and South American countries tend to be college-educated professionals who enter the country with immigrant visas, they also face problems settling in their new home. There is also an increase in the number of Latino professionals moving into the area, contributing to the growth of the Hispanic middle-class in Oregon and Southwest Washington. While most Latino households are bilingual, most prefer to get news in Spanish. With their readership in mind, the Lus take great care in considering content for both Noticias Latinas and Paginas Amarillas. Twelve years after its inception, Noticias Latinas is reaching more people – and having a larger presence – across the region. Paginas Amarillas is updated annually, with the 10 th edition set to hit the streets in early 2008. The staff has grown to three to 12 employees. Latin Media NW has sponsored the Cinco de Mayo celebration at Tom McCall Waterfront Park in the last couple of years. Both ¡Noticias Latinas! and Paginas Amarillas are produced with a singular mission: to serve the information needs of a fast-growing Latino community.